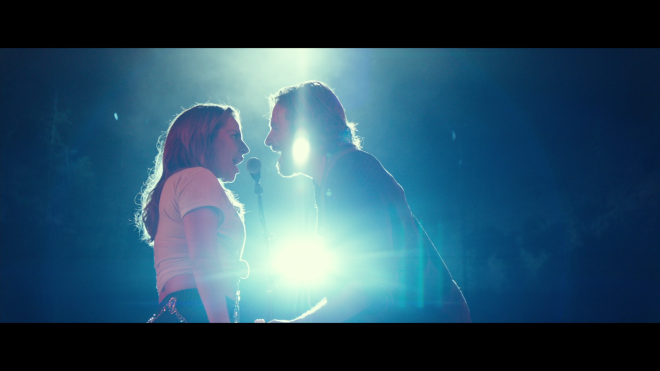 A Star Is Born marks Bradley Cooper's directorial debut, Lady Gaga's first leading role, and the fourth remake of a timeless tale about a deeply passionate love affair between two stars on opposing trajectories in their lives. The musical romance takes the Ultra HD stage with a dazzling Dolby Vision HDR presentation and a wonderfully engrossing a Dolby Atmos soundtrack, but a small selection of bonus features. Nevertheless, the overall package is Highly Recommended, making a great addition to the UHD library. Like the great masterpieces of literature, some stories are simply eternal and timeless, perfectly capturing the human condition in relatable themes for future generations to enjoy with fresh, contemporary eyes. Making his directorial debut, Bradley Cooper demonstrates this in A Star Is Born, the fourth remake of William A. Wellman's 1937 classic, in which Cooper also stars as famous country musician battling substance abuse Jackson Maine. Although the production only credits the '54 musical with Judy Garland and the '76 drama with Barbra Streisand, this latest adaptation clearly takes inspiration from each of its three predecessors — insecurities about the female protagonist's nose from George Cukor's film or Cooper looking like a modernized version of Kris Kristofferson — while still adding a few new surprises. The story maintains focus on the folktale-like journey of two lonely people on contrary paths of their careers brought together by their passion for music and each other. In all honesty, Cooper has quite the challenge in making his audience develop the same level of passion and admiration as Jackson does for struggling, aspiring nightclub singer Ally (Lady Gaga in her first leading role). Thankfully, he wastes no time in doing this with an unexpectedly stirring performance inside a drag bar where the would-be starlet does her own version of Édith Piaf's "La Vie en rose." Like Jackson, we're suddenly enthralled and moved by Ally, taken aback by an exquisite voice that even non-fans like myself will find captivating, charmed by her gracefully confident and self-assured dance through the room. Just prior to this, Jackson finished a stadium concert with thousands of adoring fans and ear-piercing music, but running to his car to enjoy the silence alone in darkness. This moment is as equally important and moving to this established rock star as it is to us, and it's in these few minutes that Cooper wins us over, believing Ally has that special something. Ironically — or perhaps, intentional on the part of Cooper — Ally's lounge-like rendition of Piaf's best-known song along with the ensuing meet-cute night talking to Jackson are terrifically telling of broader, more profound conceits that further draws viewers into an otherwise familiar and conventional narrative. The same woman who just boldly performed to a crowded room with the poise of a superstar is more comfortable singing in the skin of other artists, more relaxed pretending to be someone other than herself. However, Jackson and we see a potential she's yet to discover in herself, and it's poignant her song of choice is by one of the greatest singers of all time, someone who also never fit in society's traditional standard of beauty but had something to say and sang deep from the heart. When Ally finally takes to the stage to sing her original song, it becomes a harrowingly transformative moment where the lyrics speak to the theme of taking a risky leap in all life's endeavors. Granted, this all sounds like schmaltzy, sentimental mush expected of a major Hollywood production. However, Cooper, as their duet performance implies, embraces it with open arms and sells the fairy tale wholeheartedly — unabashed and unapologetic — about a pair who essentially discover one another when they need it most. It makes later moments and conversations all the more touching because despite their paths on two opposing trajectories — one on the rise, the other fading — they manage to find each other. Like Ally, Cooper's first foray as director and Lady Gaga inaugurated as a lead are assisted by talented backup performers. Jay Cassidy's stirringly rhythmic editing sweeps us into this romance with a pulsing tempo that crescendos into a powerfully agonizing climax, and Matthew Libatique's cinematography saturates stage performances with brash, dazzling primaries while intimate sequences are awash in warm, tender yellows. As the title suggests, Cooper's A Star Is Born erupts on the screen in the first few minutes like witnessing the birth of a celestial body, astonishing and mesmerizing us with a near-supernatural splendor, while also beholding the collapse of a nearby red giant. Such events happen often and are fairly common. But they are nonetheless enchanting and magical each time, and this fourth remake of a familiar event is just as charming and spellbinding. 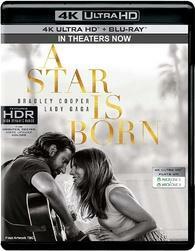 Warner Home Video brings Bradley Cooper's A Star Is Born (2018) to Ultra HD Blu-ray as a two-disc combo pack with a flyer for a Digital Copy. When redeeming said code via WB.com and Movies Anywhere, it includes the SD, HDX (1080p) and 4K with Dolby Vision and Dolby Atmos on various streaming platforms. The dual-layered UHD66 disc sits comfortably opposite a Region Free, BD50 disc, and both are housed inside a black, eco-cutout case with a glossy slipcover. At startup, viewers are taken to a generic static screen with the usual options along the bottom and music playing in the background. The musical romance makes its dramatic debut on the Ultra HD stage dressed in a spectacularly dazzling, eye-catching HEVC H.265 encode, that delivers a welcomed though not drastic step-up over its Blu-ray performance. Shot on HD cameras capable of up to 3.4K resolution and later mastered to a 2K digital intermediate, the upscaled transfer enjoys an appreciable uptick in overall clarity and definition where we can just make out slightly better detailing in the intricate design of the instruments and clothing. Close-ups, of course, expose every pore, wrinkle, and negligible blemish, and background information is plainly visible throughout. However, the 2160p picture comes with its fair share of softer moments and even a couple poorly-resolves sequences. What appears to be easy-to-overlook noise in the distance rears its ugly head in spots, and there are several instances of aliasing along the sharpest edges, with the Saturday Night Live performance being the most notable. Similar to its HD peer, contrast and brightness noticeably waver from one scene to the next. 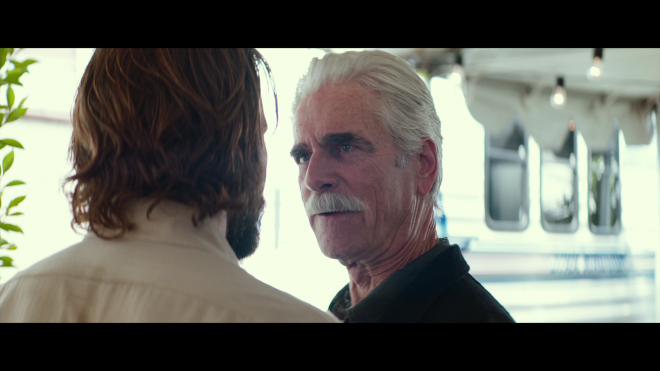 This is clearly the result of Matthew Libatique's stylized photography and not a gripe against the encode, but the jump to the HDR format nonetheless delivers significantly crisper and more radiant whites, as evidenced by Sam Elliot's saintly silver hair, the resplendent fluffy clouds in the sky and the intensely beaming stage lights. Highlights also come with a better shine and sparkle along metallic edges, but as before, the hotter, brighter spots still slightly bloom and don't really reveal any more detailing. In many daylight interiors, contrast tends to fall on the lower end of the grayscale, which in turn, can affect brightness levels, making for some rather flat moments. Admittedly, blacks are richer with improved shadow delineation, but not by a significant measure, still looking a tad faded and murky in some areas while crushing some of the finer details in the clothes and darkest corners. A rising star sings her heart and soul in this equally fantastic and wonderfully engrossing Dolby Atmos soundtrack, which actually defaults to DTS-HD MA 7.1, requiring owners to make the switch within the pop-up menu. To be fair, the track is not the sort to give one's audio system a generous workout or meant to compete with action-heavy blockbusters, as the character-driven film is focused on the dialogue and singing vocals, which it delivers with aplomb and superb precision. Instead, the front-heavy design benefits from the object-based format by occupying the entire soundstage with lots of background activity that fluidly moves between the three front channels and top heights. This makes for some spectacularly stirring and powerful stage performances, a half-dome soundfield that's continuously engaging and captivating. The music and vocals reverberate throughout the room while the cheers of the audience echo all around and overhead, placing the listener in the middle of what often feels like a real-life live concert. The only supplement shared between both formats is the "Musical Moments" in Dolby Vision while the rest can be enjoyed on the accompanying Blu-ray. The Road to Stardom (HD, 30 min): All-inclusive doc exploring nearly every aspect of the production, from the casting and performances to the plot and music with lots of cast & crew interviews praising all involved and Cooper's dedication to the role of director and singer. Jam Sessions and Rarities (HD, 7 min): Trio of rehearsals with Cooper and Lady Gaga. Music Videos (HD): Four performances with Lady Gaga, including one with Cooper. Musical Moments (HD): Viewers can quickly jump to specific songs from the movie. 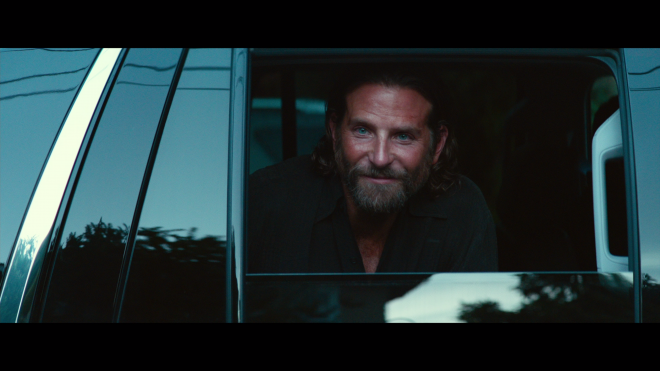 In Bradley Cooper's A Star Is Born, he demonstrates that a remake can be just as good if not better than its predecessor when done right. 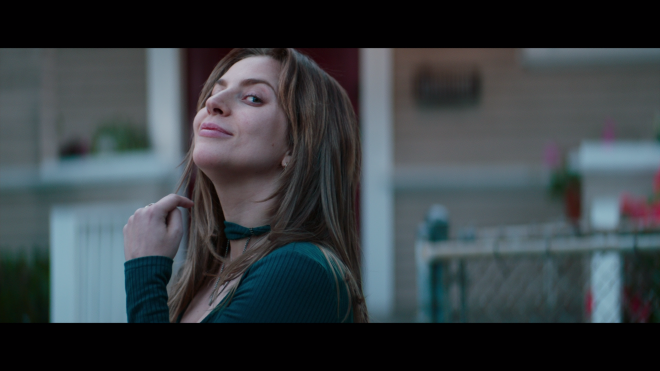 Starring Lady Gaga in her first leading role, the love story about one person's sudden rise to superstardom while the other's downward spiral ironically parallels the lives of its two leading stars, charming audiences with excellent performances, catchy tunes, and some highly talented filmmaking. The musical romance debuts on 4K Ultra HD stage with a dazzling Dolby Vision HDR presentation that nicely improves on its HD SDR counterpart and a wonderfully engrossing a Dolby Atmos soundtrack that splendidly complements the visuals. Although the selection of bonus features are on the lighter side of things, the overall UHD package is nonetheless highly recommended for fans and those wanting more HDR goodness.